Maine's preliminary seasonally adjusted unemployment rate estimate of 3.4 percent for February is little changed from 3.5 percent in each of the last six months, the state's Department of Labor said Friday. 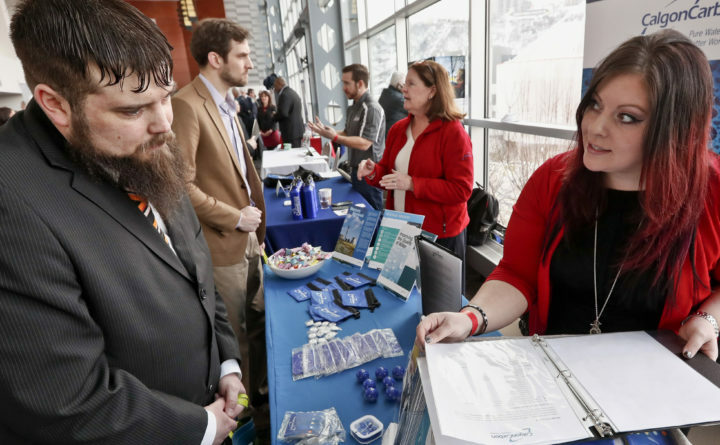 This March 7, 2019, photo shows visitors to the Pittsburgh, Pennsylvania, veterans job fair meet with recruiters at Heinz Field. Maine’s unemployment rate nudged down slightly to 3.4 percent in February, and remained below the 4 percent mark for 38 consecutive months, the longest stretch on record. The Maine Department of Labor and the U.S. Bureau of Labor Statistics on Friday released the preliminary seasonally adjusted unemployment rate in its household survey. The rate has been 3.5 percent in each of the last six months, and was 3.2 percent one year ago. The number of unemployed people increased by 1,900 over the year to 24,100. The U.S. preliminary unemployment rate of 3.8 percent for February was down slightly from 4 for January and 4.1 percent one year ago. The New England unemployment rate estimate for February was 3.2 percent, with New Hampshire at 2.4 percent, Vermont at 2.4 percent, Massachusetts at 3.0 percent, Rhode Island at 3.9 percent and Connecticut at 3.8 percent. Maine’s statewide unemployment rate that was not seasonally adjusted was 3.9 percent for February, little changed from 4.0 percent one year ago. Unemployment was lowest in Cumberland County at 2.7 percent and the highest in Washington County at 6.3 percent. Among metropolitan areas, the unemployment rate was below the statewide average in Portland-South Portland at 2.9 percent and Lewiston-Auburn at 3.6 percent and close to the average in Bangor at 3.9 percent. March estimates will be published Friday, April 19.